We've got answers. If something isn't covered, get in touch! What is a meal subscription? A meal subscription is similar to a gym membership. When you subscribe for meals, these meals will be delivered each week. The menu is a set menu week to week and will be rotating. You can subscribe to a 10 meal package (no lock in contracts, see cancellation policy FAQs for further detail). Can I order meals from week to week? Yes you can, but not on our weekly meal plan. Our weekly meal plan is fixed and includes 10 total meals made up of 6 different menu items (1 vegetarian option each week). You can’t pick and choose your meals with the weekly meal subscription, but if you want more flexibility you can always order them as you need them! Meal subscription vs weekly ordering, which should I choose? By choosing the meal subscription option you will receive FREE DELIVERY. You won’t have to remember to order from week to week and are guaranteed fresh, healthy meals to be delivered to your door. We take care of the choice and work for you. When is order cut off? Order cut off will be Thursday at 8pm. Because my meal delivery is on a Tuesday, what do I do about meals for Monday? We also do a Monday night delivery for the Caloundra, Kawana, Mooloolaba and Maroochydore Areas (If your address falls under this delivery route you will receive a text message each Sunday to confirm Monday night delivery). We will offer a freezeable meal each week to heat up on Monday. These meals will be highlighted with an icicle icon on the label of the meal. How do I pay for a meal subscription? For meal subscriptions, payment will be taken automatically from your credit card each week. The subscriptions are processed early Friday morning. How do I pay for meals ordered week to week? All orders made from week to week must be prepaid by credit card, and will be delivered the following Tuesday. The cutoff for orders is Thursday 12pm. Deliciously Clean Eats only accepts Visa & Master card. AMEX is not accepted. What if I have to go out of town while I have an order placed? The Deliciously Clean Eats team understands that schedules change and travel are all apart of life, and we aim to be flexible in meeting your needs. We require 72 business hours notice prior to delivery to make any amendments to orders (please contact us within business hours 7:30am-5:00pm Monday to Friday). We require 3 business days’ notice (at least 72 hours) to cancel orders. Once purchased, orders are non-refundable. If you wish to cancel your order, a credit can be added to your file to be redeemed when you are ready. To get re started, simply re subscribe. For the suspension to take place, we must be notified within business hours which are Monday to Friday 7:30am – 5:00pm. Remember, meals are freshly prepared and delivered on a Tuesday. After order cut off, your fresh fruit and vegetables, produce and other ingredients are ordered. What do I do if I am allergic to or dislike a certain food? You can choose meals to suit your personal dietary requirements from our weekly menu. All dietary requirements (GF, DF,VEG) will be indicated on the website and meal package. If you have a severe allergy to a particular food (or anaphylaxis), then we would not recommend ordering as we are not able to accept any responsibility for any allergic reactions which you may experience. Please note we are only delivering to the following postcodes: 4019, 4020, 4171, 4504, 4505, 4506, 4507, 4508, 4510, 4511, 4516, 4519, 4550, 4551, 4553, 4554, 4555, 4556, 4557, 4558, 4559, 4560, 4561, 4562, 4563, 4564, 4565, 4566, 4567, 4568, 4572, 4573, 4575. If you are outside these postcodes but still on the Sunshine Coast, we have two pickup locations at Maroochydore and Caloundra. If your postcode is not listed above, please email [email protected] and we will see what we can do. How much will it cost for meal delivery? Delivery for meal subscribers is FREE. A small fee of $15 will be included if you would like meals delivered, this will be specified when placing your order. Alternatively, you can pick your meals up free of charge from our office in Caloundra or CrossFit Mooloolaba (on Wises Road) between the times indicated below. How soon will I begin receiving my meals? After you have made your order, your meals will be delivered on the next Tuesday. Please remember the cutoff date for orders is MIDDAY Thursday. Any orders received after MIDDAY Thursday will be delivered in the following week. You will need to supply specific delivery instructions along with a key or swipe card for access into secure buildings. You can either post or drop your key in to us at our kitchen address (4 / 17 Newing Way, Caloundra). Unless otherwise specified, our team will keep hold of your key until you request that it be returned. If security access is not possible, the Team will leave your package at the main entrance door of your building. 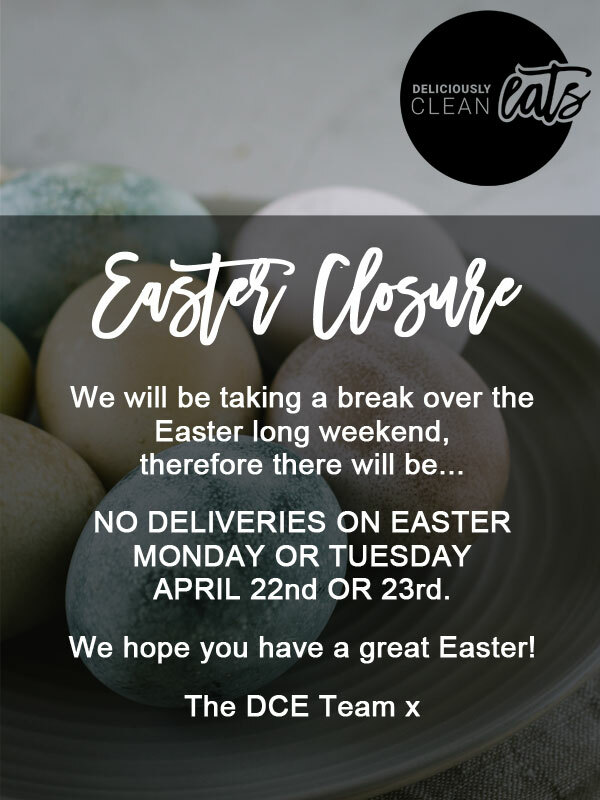 For any alternative arrangements or to amend your delivery details, please contact the Delivery Clean Eats team via our contact page. What time can I expect my deliveries by? For Monday Night Deliveries: You will be notified via text message if your meals will arrive on Monday Night. All Monday Night deliveries occur between 5.30pm and 8.30pm. For Tuesday Morning Deliveries: All meals will be delivered between 4 am 8am to your nominated address. Please email [email protected] if you have any enquiries about delivery and time. Please note we cannot provide a specific delivery time as these vary day to day. There are two pickup addresses where you can collect your meals on Tuesday. You must specify at checkout which delivery option you want to use. How are Deliciously Clean Eats meals delivered? Your meals will be delivered in a Styrofoam box containing ice bricks to keep the meals cool. Meal containers can be recycled and are microwave safe. Deliciously Clean Eats Styrofoam boxes will be sealed with tape for security. Please contact the office immediately if the security tape has been removed or tampered with. What do I do with my Styrofoam box and ice bricks? Please leave your empty Styrofoam box and ice bricks out for collection the night before your next delivery is due. If you are not receiving any further deliveries, please contact us to arrange collection. If you are picking up your meals, please bring your Styrofoam box with you for collection. Can I get my meals delivered to an alternative address? Definitely. Through your account you can amend details yourself. Please contact the Deliciously Clean Eats team if you have any issues. We require at least 72 business hours prior to delivery to amend this on your profile. What if my food does not arrive or it is not all there? Once delivery has been made, we are unable to accept responsibility for any stolen meals. Please contact the Deliciously Clean Eats team to discuss any issues. What day and time do I pick up my meals? After you have made your order, your meals will be ready for pick up on the next Tuesday. Please remember the cutoff date for orders is MIDDAY Thursday. What can I take out of my meal plan? We offer an interchangeable carbohydrate option (e.g. cauli/broccoli rice for brown rice or zucchini noodles for rice noodles or pasta). Please note however, that by excluding meal items the nutrition value of the meal will be different to that specified. If you wish to make any other amendments, please enquire through email. Can I remove certain vegetables, herbs or spice? Unfortunately, as all of our meals are prepared in bulk we are unable to remove ingredients that do not make up the main component of the dish. What if I am Vegan or Vegetarian or Pescatarian? Currently, we will be including 1 vegan/ vegetarian option in the menu each week. If you would like to exclude the meat component of the meal to meet your needs, please specify. What if I want to make the meal low carbohydrate? We will be offering some interchangeable low carbohydrate substitutes for carbohydrate options. These include zucchini noodles instead or pasta/rice noodles or cauliflower/broccoli rice instead of brown rice. This is designed to ensure you can alter the meals to suit your needs and training goals. Please select desired options when ordering. How do I heat the food? The meals can either be heated for 2-3 minutes in the microwave within the container provided or transferred to a plate and reheated. If heating in packet, remove plastic seal prior to heating along with any sauces and dressing containers. If you do not have a microwave or prefer not to use one you may also reheat the meals on the stove or in the oven. The instructions are also included on the package for your convenience. What do I do with the sauces? Deliciously Clean Eats dressings and sauces are served in individual 30ml containers. These dressings and sauces can be added to suit your preferences. They are portion controlled, and made with heart healthy oils and other nourishing ingredients. Sauces and dressings should be poured over the meal either before or after heating. Please ensure you remove the sauce container before heating. Should I add any other seasonings or condiments to my food? All meals have been seasoned, however, you may wish to add extra seasoning such as salt and pepper as desired. How long can I keep my meals for? Meals will keep well in the refrigerator for up to 3-5 days after delivery (indicated on meal label). Meals can also be frozen if necessary (indicated with icicle icon on label). Each week in the menu for meal subscriptions, there will be a meal that can be frozen for convenience. Meals should be transferred to a refrigerator immediately after delivery. Please ensure meals are transferred to a refrigerator within 2 hours after delivery. Styrofoam boxes will be chilled with icepacks, however we take no responsibility for meals after delivery has occurred. If you do not have a microwave or prefer not to use one you may also reheat meals on the stove or in the oven. Simply transfer the meal to an oven proof dish and heat. Which meals should I choose to eat after training/exercise or outside of training/exercise? Here at Deliciously Clean Eats we are 100% dedicated to helping you achieve your goals and would love to help where we can. Our first step to supporting this is through interchangable carbohydrate options. Stay tuned, we have lots in store for the future to continue to ensure meals are made as individual as possible.